Although we’ve taken a few trips, there are special trips we’ve planned for many years. One of these days we’re going to know it’s time and head out. Planning is essential. When you’re on a trip you’ve got to know where you’re going and how you’re going to get there. You also need to know what sights you want to see along the way. Without planning it is easy to get mixed up and focus on the things you really didn’t intend to do. Many sights along the way easily become distractions. Distractions steal time, money, focus and joy. We are all on a trip called life. But some of you are embarking on huge trips. These weren’t planned vacations but there is still much planning required. You’re going to need extra strength because you’re about to go over the rocky mountains of your faith. You’ll have to know where you are going – what you want your destination to be. Always plan that the destination of this journey will turn out for your good and God’s glory. You’ll want to remember to focus on the most important things – loving one another, believing God, reciting His Word and believing He will guide you all the way. Oh beloved, this is no vacation you are headed for. For some of you it’s the trip of a lifetime and yet it’s a horrendous thought as to the peaks you will traverse. What God wants you to know this morning is that He will get you through it. He will help smooth the worst spots, keep you focused on Him and provide you with safety and peace all along the way. Just because the trip is looking disastrous, He doesn’t want you to pronounce it over. This journey is going to take a while, but you can count on His strength and courage to walk with you all the way. You have more than a GPS to guide you – you have the heavenly host surrounding you with their protection. The enemy will tell you that you’ll never make it, but always remember GOD IS WITH YOU. 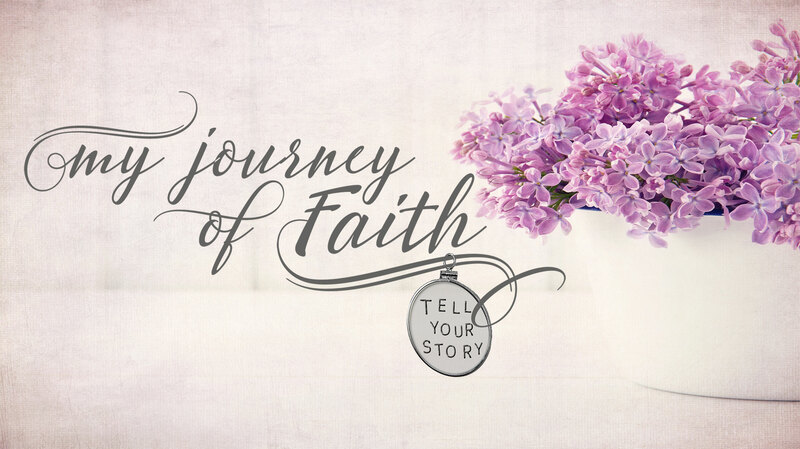 While you travel through and ultimately beyond this present expedition of your faith you will discover beautiful things – your love for God will increase tremendously. Your belief in His loving care will be discovered fresh and new. Your knowledge of His Word will increase and so will your intercessory prayer life. You will learn to focus on the right things so you won’t get distracted – loving, praying, remembering and delighting – in one another and in God. God loves you and He’s for you. This is your essential truth for the road ahead. Never lose hope because as you pray heaven listens. As you weep the LORD gathers your tears. As you look for answers, God will be your answer. God loves you. God is for you. You will find that the messy trip you are on will turn into a message of hope to remember when the journey is done and to share with others so they too can find hope and joy in their journeys. And finally, always remember, no matter what you see with your eyes, that God answers prayer. Keep praying, keep seeking, keep knocking. 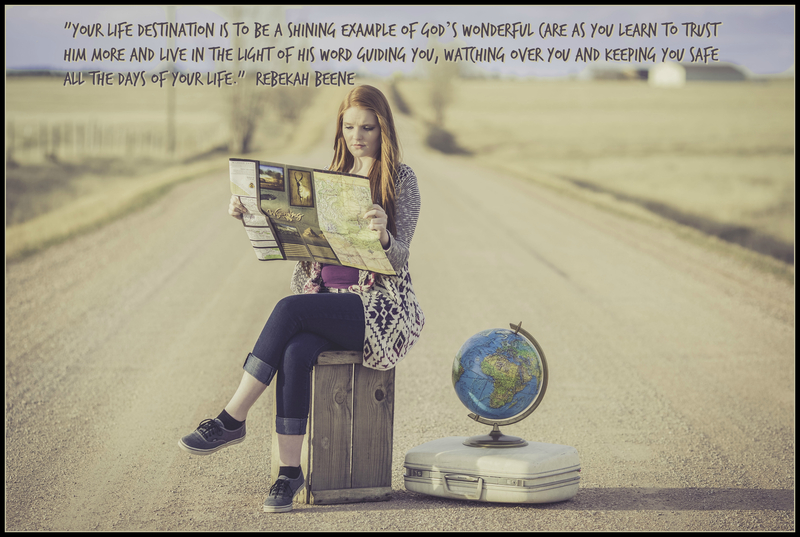 Your life destination is to be a shining example of God’s wonderful care as you learn to trust Him more and live in the Light of His Word guiding you, watching over you and keeping you safe all the days of your life. 2 Corinthians 5: 7 for we walk by faith, not by sight. Matthew 7: 7 Keep on asking, and you will receive what you ask for. Keep on seeking, and you will find. Keep on knocking, and the door will be opened to you. Psalm 34: 4 I sought the LORD, and He answered me, And delivered me from all my fears. Isaiah 55: 12 For you will go out with joy And be led forth with peace; The mountains and the hills will break forth into shouts of joy before you, And all the trees of the field will clap their hands.